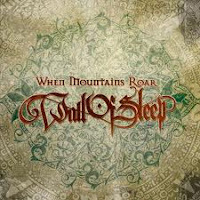 I have heard nothing of Wall of Sleep before, and I know nothing of them, aside that they are a stoner/doom act. This is a tale of my virgin ears to Wall of Sleep, and what they determine the group to be. I am/was very surprised by When Mountains Roar. I have been listening to so much stoner/doom that I have been getting sick of the genre. I really was in no hurry to hear Wall of Sleep, but now I am in a hurry to hear the rest of their catalog! The album is not stoner by any means, and even the doom is stretched a bit. It's like a classic rock band decided to add the plodding sound of doom to their latest record - a pleasant surprise after so many acts that sounded the same. This album really reminded me of the straight-forward era of metal from the 70s or 80s. It a little reminiscent of NWOBHM American bands that were from this time, but not in the power metal-esq vibe. Power doom metal I guess would be the best way to describe it. I know, I know, I'm doing another crappy job at describing the sound of the act, but cut me some slack; I'm at work, tired and hung-over. You're all lucky you're getting anything from me today, so enjoy what you read and move on.